This past fall my talented partner, Ed Ralston, pulled out drafting paper and pencil and we marshaled resources to construct a new structure on my property designed explicitly for one purpose: to serve as a gallery, to permanently display my various types of arts and crafts. 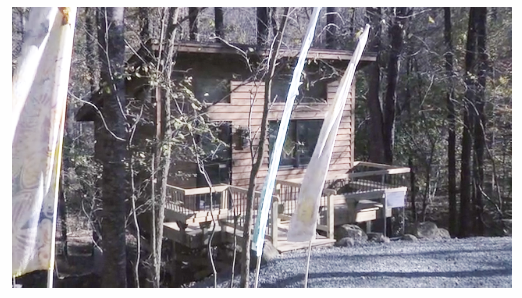 This structure is positioned at a special spot on my property, which is more accessible to visitors than my functional studio located down a path around the far side of my house. This new gallery is now the first thing you encounter when you venture onto my property. After traveling down a long wooded drive you come upon an open area surrounded by boulders which mark this prime spot. From this vantage point, you will notice the steep hills on my property falling down to a creek and an open area filled with lush moss. Among the rock formations and garden sculptures are a variety of indigenous ferns. My new building is small but near-perfect from my perspective, designed with craftsman style details. Windows at the front and top face north, while small trapezoidal windows are positioned high at the front sides of the space to maximize light. In addition to the natural light and excellent gallery lighting, a series of small cable lights are strung from left to right and front to back. Each ‘satellite’ is positioned to focus on one piece of wall art or onto individual fused glass pieces placed on rolling display carts. In addition to the work placed along the walls and windows, there is a wooden display rack (also built by Ed) that holds a series of fingers that swing out to hold a wide array of my woven and marbled silk shawls and scarves. Individual fused glass pieces are placed directly in front of the windows so that light pours in behind the glass, enhancing the translucent quality and design of the pieces. Also, the fused glass pieces are placed on heavy, handcrafted, lucite display stands of various heights. I have grouped the pieces to complement and emphasize their color schemes and particular designs. Here is a video that shows you what the inside of my new gallery is like. You might note that the color of the bronze metal plate of the carriage lamp is repeated in the bronze pickets of the seated area, cantilevered around the front of the gallery. It even has a doorbell to alert me when a visitor has actually arrived on the scene and needs me to sprint up to the gallery to share my wares! To see it in person, call to make an appointment. 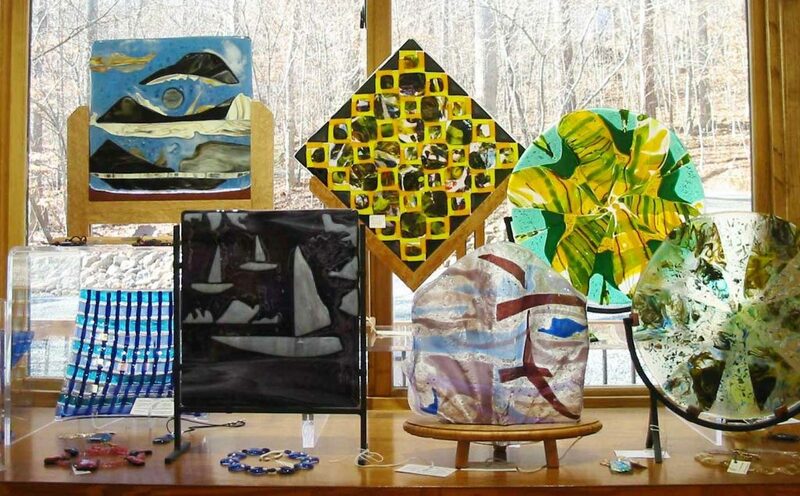 919-933-2891 The gallery is located at 15 Woodside Trail, Chapel Hill, 27517. At the same place where I participate in the Orange County Artists Guild tour! By the way, during the year I plan to host different artists; when it is warmer I hope to engage musicians and poets to “hold court” at different deck locations on the property during an opening for each featured artist. So keep your eyes on the monthly events posted on the Events page at this OCAG blog site! Very cool. In fact, extraordinary! Thanks Mary Mendell for taking the time to comment on my latest article. It is most rewarding when we know other’s enjoyed reading about our activities or art!